So, it’s been a while since I’ve posted but Around The Hemline is back! So, last Monday marked a very special day for me because it was my official One-Year Anniversary since moving to New York! I am amazed at how quickly time has come. With my Summer absence, I’ve done a lot of reflecting and a lot of growing. I think it’s imperative that we never stop allowing ourselves to make mistakes and grow. Moving to New York was a leap of faith for a brand new beginning – a new chance to become a better person. During the year, I’ve been pushed to the limits – dealing with difficult people and challenging projects at work, learning how build small businesses, maintaining a new blog and networking within the blogging scene, and building a relationship with my boyfriend and an even deeper relationship with family and friends. I also learned forgiveness to people that have hurt me and how it allowed me to set myself free. I know these seem obvious facts of life, but until you are truly faced a situation you cannot guarantee what your reaction will be. There were several moments where my right brain (feelings and emotions) conflicted with my left brain (facts and logic)! There have been several late nights where I contemplated next moves, where I thought I just couldn’t make it through the week, or even thought of running back home but I ask myself day-to-day what am I going to do today that will make it better than yesterday? How can I move myself forward and with faith on my side, move the people around me forward? 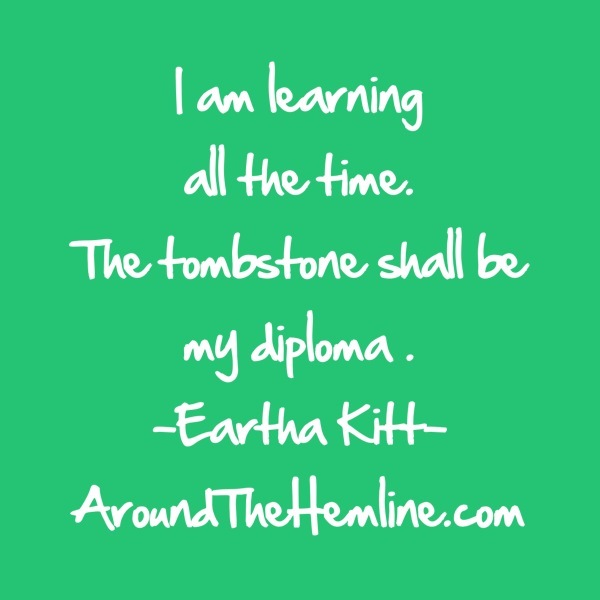 Everyday you learn to either be positive or negative but as the amazing vocalist Eartha Kitt said, “our tombstone shall be our diploma! Never stop learning! Have an awesome week and stay tuned for my favorite New York Fashion Week looks and fashion shows I’ll be attending!